Wood-framed construction is the predominant method of building homes in the United States and has gained steady acceptance in light commercial and industrial buildings. 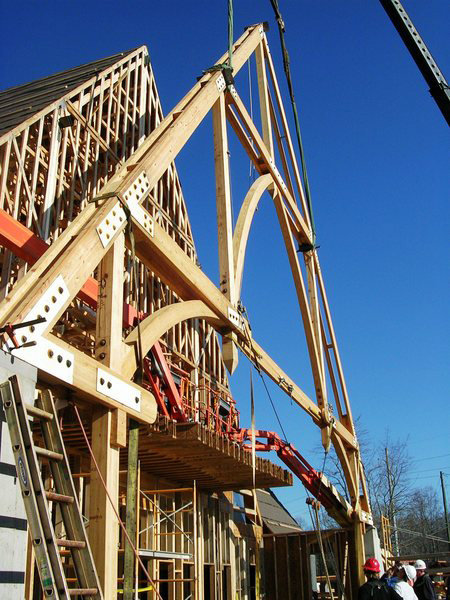 The inherent strength of wood framing, its cost effectiveness, and energy efficiency have all been borne out over hundreds of years of use. 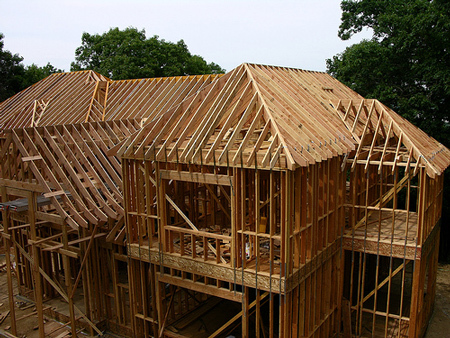 Building code changes, environmental sustainability, and homeowner interest in higher building performance are a few factors placing new demands on this popular approach to framing. Most recently, resiliency in buildings has become a priority, particularly in areas prone to severe weather. The not-for-profit Resilient Design Institute defines resiliency as “the capacity to adapt to changing conditions and to maintain or regain functionality and vitality in the face of stress or disturbance. It is the capacity to bounce back after a disturbance or interruption.” In response to these changing needs, building professionals are adopting new products and practices to strengthen wood-framed buildings, with a particular focus on roofs. This course will focus on some of the changing considerations in the design, basic construction anatomy, and best practices that can lead to high-performance, resilient, wood-framed roof construction. Identify the natural, environmental forces that wood-framed roof systems need to be designed to withstand in order to protect public safety and welfare. Assess the advantages and disadvantages of different types of wood-framed roof systems and common roof slopes as part of a durable building design. Compare and contrast different types of wood roof sheathing in terms of their performance capabilities. Designing high-performance roofs is a function of a complex interplay of key factors and special considerations. Understanding the basic environmental loads or stressors that a roof needs to endure in a particular project location is the first step. Then selecting the best combination of roof shape, framing technique, and materials all contribute to a design that will remain durable and last for its intended life cycle. The list of things that a roof needs to contend with from the environment includes everything in the local weather forecast. • Water: Whether in the form of liquid rain, gaseous vapor, or solid snow or hail, water is usually the first thing a roof is designed to guard against. Historically, in fact, the biggest cause of design liability claims have come from water leaking through a roof system. Roofs that don’t drain properly, aren’t fully sealed where needed, or don’t anticipate worst-case scenarios are the usual culprits for leaks. Condensing moisture in the roof system can also be a significant problem since it can degrade wood and other building products. Of course, any area that receives a lot of snow needs to address the weight of that snow to guard against not only collapse but sagging or other movement, too. Plus, the insidious nature of water that forms from melting snow and then freezes into ice can wreak some all too well-known havoc on the roof system. The concerns about water in any form don’t manifest themselves only after the building is occupied, but during construction, too, particularly with wood framing. Dusty Bitton, owner of Pinetop Custom Homes, is located in McCall, Idaho, which has the highest average snowfall in Idaho and only a five-month building season. 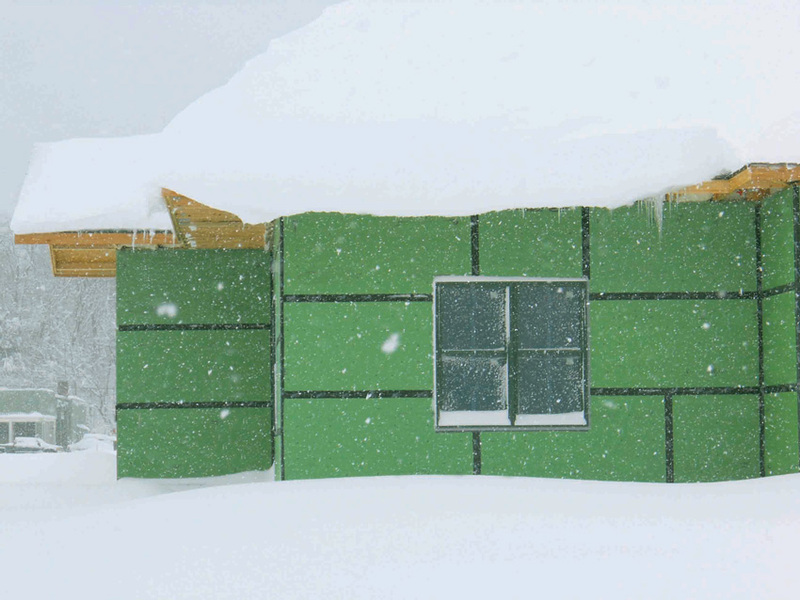 “At times, we are unable to complete our buildings before the heavy snowfall hits so we must depend on moisture-resistant products to prevent any issues until we can continue the building process the next spring,” stated Bitton. • Wind: Wind damage, too, is a common cause of roofing failures. The Federal Alliance for Safe Homes (FLASH®) reports that more than 39 million U.S. homes are at risk from winds that can exceed 110 miles per hour based on HUD and census data analysis from FLASH.1 (Designers can visit flash.org to see if their locations are at high risk for a number of different “peril” situations.) The design load for wind uplift of a roof is a complex formula that is determined by such factors as roof structure, slope, wind speed, building height, roof areas, building terrain, building type, and building openings. Calculators exist to determine the design wind loads for the roof area’s field, perimeter and corner zones, and minimum recommended design wind-resistance loads based on the specific building and climate parameters.2 Once calculated, the force can be used to influence the materials selected for the roof so they cannot be torn from the building in strong winds. Of course, there is wind, and there is severe wind, as in tornadoes or hurricanes. Anticipating these severe conditions in locations where they are common requires extra attention to detail and diligence to help assure the roof system doesn’t fail. FLASH has partnered with The American Institute of Architects (AIA) and other design organizations to create the Resilient Design Guide for High Wind Wood Frame Construction.3 This detailed, 48-page publication, which is free and available to the public, describes the effects of wind on wood-frame constructed buildings. It also clearly and succinctly identifies the differences between common wood-frame construction, high-wind construction, and resilient construction. Recognizing the importance of assuring the integrity of a roofing system, a number of organizations and agencies have developed guidelines and standards for design and construction. These include model building codes, regional and federal standards, and industry programs. 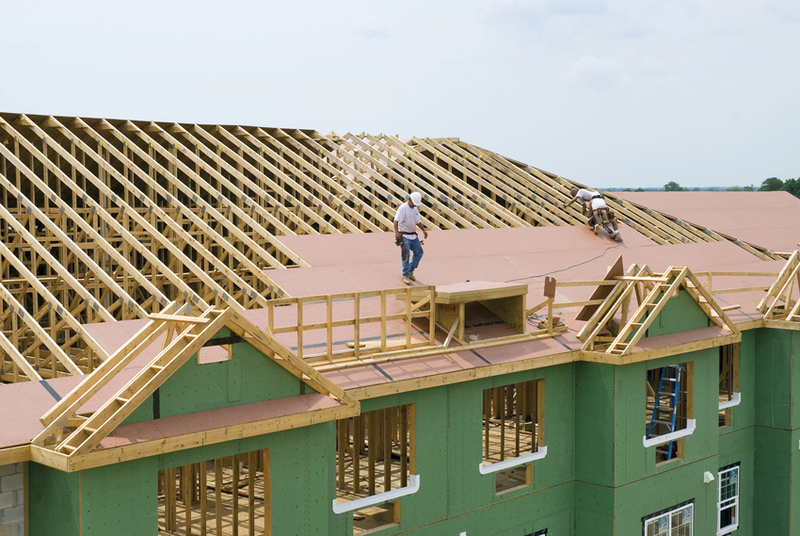 In terms of codes, the International Building Code (IBC) and the International Residential Code (IRC) have established specific requirements for wood-framed roof construction to provide durable materials guidelines for the sake of public safety. These codes are either adopted directly or are the basis of most of the code requirements in the United States related to the assembly of wood-framed roofing systems. They address all of the components collectively, acting as part of a functioning system, while in some cases they prescribe certain items or materials as safeguards. In terms of relevant standards, the Federal Emergency Management Agency (FEMA), for example, has produced a series of 37 fact sheets to provide technical guidance and recommendations aimed at improving the performance of buildings subject to flood and wind forces in coastal environments. Known as FEMA 499, these recommendations are not requirements unless the local code references the document, although they are considered good practice in coastal regions. One of these FEMA recommendations suggests taping the seams of roof sheathing panels to provide better protection against water infiltration if the roof covering ever blows off. Such infiltration during a severe storm can lead to a tremendous amount of water damage inside the home. In the experience of North Carolina custom home builder John Paul Corey of East Carolina Construction, taped panels held up very well on his projects after Hurricane Irene battered the North Carolina coast in August 2011, producing winds in excess of 80 miles per hour. “Other projects in the area had either tar paper on the roof or building wrap on the exterior, and 60 to 70 percent of their materials blew off during the storm that then had to be replaced,” notes Corey. Another voluntary program that can yield homeowner insurance savings has been developed by the Insurance Institute for Business & Home Safety (IBHS). This organization is an independent, nonprofit, scientific research and communications organization supported solely by property insurers and reinsurers. IBHS’s building safety research has led to real-world solutions for home and business owners, helping to create more resilient communities. It has developed a program known as the FORTIFIED Home™, which is “a set of engineering and building standards designed to help strengthen new and existing homes through system-specific building upgrades to minimum building code requirements that will reduce damage from specific natural hazards.”4 Homes built to FORTIFIED Homes standards are inspected by a FORTIFIED Homes professional and certified as compliant. Homeowners don’t just walk away with a certification, but an important piece of documentation they can then take to their home insurance companies to help significantly, in some areas, reduce their homes’ insurance premiums. The amount of savings will vary based on location and circumstances, but can be significant. The roof construction of a building is a fundamental item to address under the FORTIFIED™ Home standard intended to improve resiliency and possibly reduce property insurance costs. The FORTIFIED Home program has three levels of designation—Bronze, Silver, and Gold—that build upon each other, allowing designers to choose the desired level of protection best suited to the project budget and resiliency goals. The critical component of resilient design, according to FORTIFIED Homes, is the roof system, which is part of every designation level. Recommended practices to achieve any of these designations include taped roof sheathing seams to reduce wind and water entering the attic through the roof covering and vents. 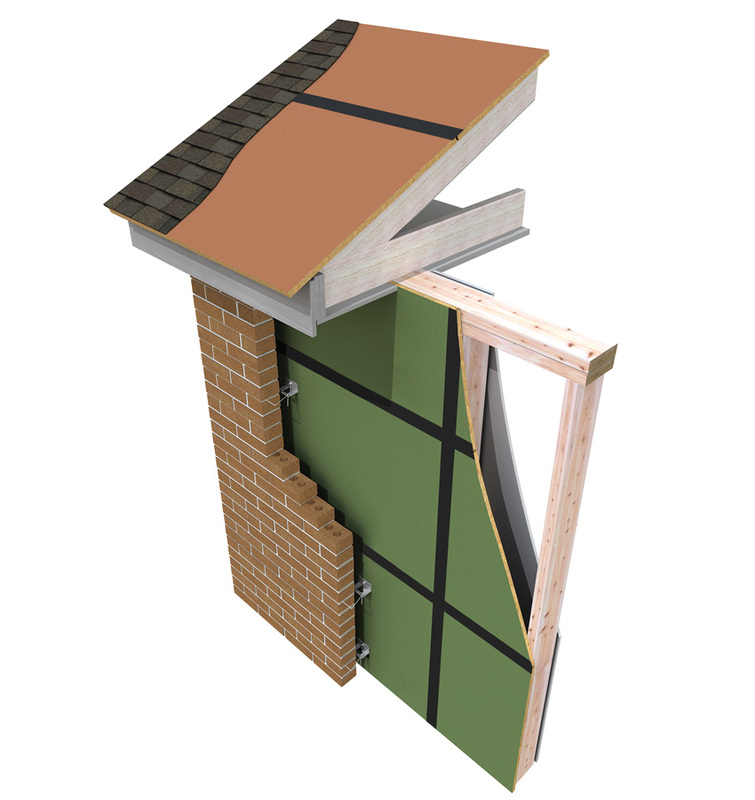 One all-in-one roof sheathing system incorporates a structural engineered wood panel with a built-in water-resistive barrier with advanced acrylic adhesive tape to seal panel seams. 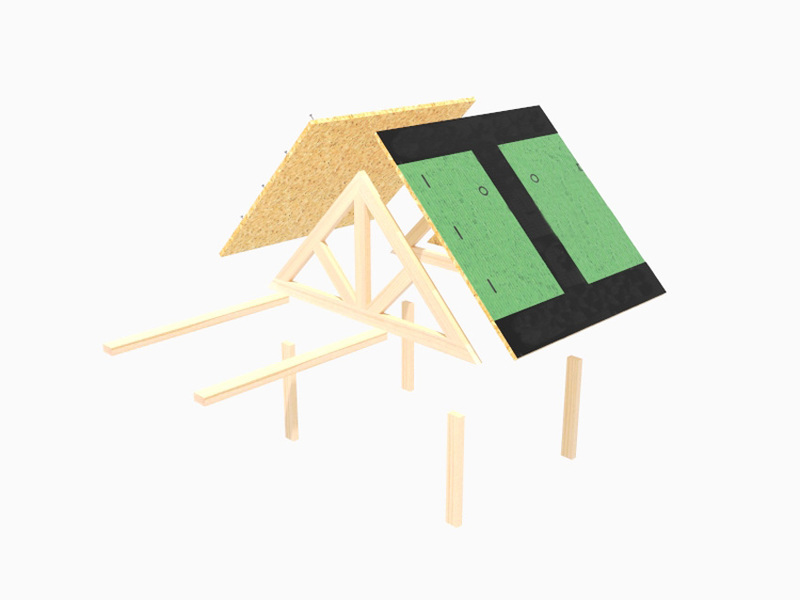 This simple two-step system eliminates the need for felt and the chance of water getting trapped between the sheathing and water barrier, under a high-wind event, if the roof covering is blown off. In many areas, the residential building code does not require a sealed roof deck. However, a simulated hurricane test conducted by IBHS demonstrates how a sealed roof deck using advanced acrylic adhesive tape can help protect against water and wind penetration under extreme weather conditions.5 The cost differential of repairs IBHS has calculated due to water damage in this testing scenario compared to the minimal investment to tape a roof deck lays out a motivating, positive return on investment. Along with a sealed roof deck, the other components of FORTIFIED Bronze roof construction include ring shank nails for greater nail-hold capacity and uplift, as well as the need for structural sheathing on the gable ends and truss or rafter bracing to better resist lateral loads during high wind events. Once the roof is addressed, the Silver level then addresses windows, doors and attached structures. After the first two levels are achieved, then the Gold level ties the house together by connecting the roof to the walls to the floors to the foundation, so everything acts as one complete system. With an understanding of the forces and principles at work and some of the programs and standards that can influence design, let’s take a closer look at all of the components of a wood-framed roof. As we look at each, we can delve into the role they play individually and collectively toward achieving a high performing system that is resilient enough to withstand severe conditions. Pitched roofs tend to be favored in wood-framed construction because they require little maintenance and have long service lives. While the slope has an effect on the roof style and materials used as well as the space in the building’s interior, the primary purpose of sloping a roof is to shed water. Many roofing contractors maintain that conventional or steep-sloped roofs are generally more expensive in first costs than their lower-sloped counterparts because of the framing to create the slope. However, they also last longer, require much less maintenance, and withstand water better over time compared to flat or low-slope roofs. Since a sloped roof is essentially designed to drain water away, not contain it or seal it out completely as in a flat roof, the choice of materials are broader. On the other hand, flat roofs may be cheaper to build in terms of structure, but the single-ply membranes appropriate for use are limited in choice and usually a more costly material. Furthermore, over their service lives, flat roofs will likely require regular, ongoing maintenance and can be more prone to roof leaks. The biggest concern with flat roofs is the creation of “ponding” that can occur with a heavy rain or snowfall. The added weight can cause the sheathing or substrate to sag and allow water to collect or “pond” on the roof, and thus keep it from flowing to the roof drains. Or snow and ice could build up and similarly prevent the drainage of water. This standing water on the roof then adds unanticipated long-term weight and means that the roofing membrane needs to be fully watertight to avoid leaks—in effect acting like a swimming pool or bathtub liner. While some commercial buildings are able to successfully use flat and low-slope roofing, residential wood-framed buildings more typically rely on the shedding properties of sloped roofs. Having determined the best roof slope for a particular building, the next consideration in a wood-framed system is the type of roof construction: stick built on-site or premanufactured roof trusses. Each system will rest on dimensional lumber or engineered wood that forms the wall structure below it, and each roof construction type has its own advantages and disadvantages. Stick-built wood framing for roofing structures relies on field-cut rafters to accommodate the proper roof slope, overhangs, and details. • Stick-Built Roof Framing: A stick-built roof consists of individual rafters, each cut and secured by the builder to form the shape and pitch of the roofline. 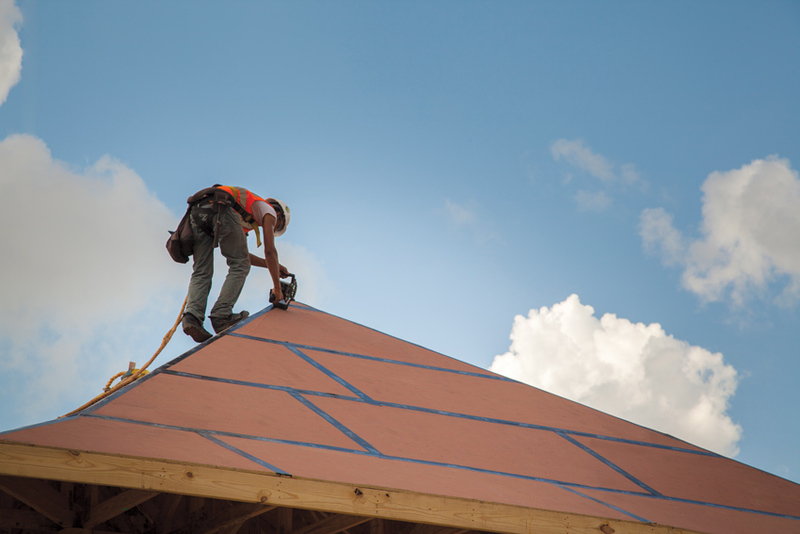 All roof members are typically cut and installed on-site. The rafters are sloped, attached to the top of the wall framing, and sit on an incline to create the roof pitch. Flexibility is the area in which stick-built roofs often have an advantage. Although trusses can be customized for many types of structures, they may fall short when it comes to complicated roof designs that incorporate specialty features, such as numerous dormers, hips, rolling hips, or turret roofs. Stick built also has an advantage in structures that must accommodate attics or cathedral ceilings, as roof trusses typically use the attic space for the structural makeup of the truss, not for living space, and can’t be modified without compromising their strength. Wood-truss construction for roof framing is generally regarded as more cost effective than stick built and capable of achieving customized solutions. • Truss Construction: Roof trusses are commonly a triangular pre-engineered assembly made from 2-by-4 or other dimensional lumber that is cut and pressure nailed together. Multiple trusses, commonly spaced at 16 or 24 inches on center, are used to create the underlying frame of a roof. Trusses are usually engineered and manufactured off-site to exact specifications and can be mass produced efficiently, reducing costs, the size of the roofing crew, and delays from errors that can occur on stick-built roofs. Truss systems are custom engineered and fabricated for a specific job and cannot be altered on-site without re-engineering. 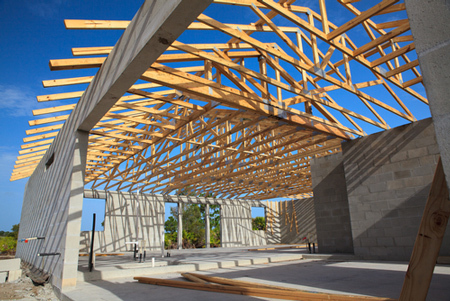 Despite the fact that with stick-built construction all framing lumber can be purchased locally and delivered quickly, it is generally considered that a roof truss system is more economical. This has become so well accepted that in many areas, roof trusses have replaced traditional stick framing, saving labor and simplifying the roof-framing process. Further, using advanced computer modeling, truss fabricators can create designs incorporating required loadings and space-saving shapes with minimal waste. Serving as a structural skin that ties the rafters or trusses in place, roof sheathing supports the roof covering and transmits the load of this material as well as the live loads due to snow, ice, and wind back to the rafters or trusses. Once nailed in place, the sheathing becomes the base for fastening the roof coverings. In the early 20th century, most roof sheathing was made from cut wood planks. Today, roof sheathing is typically either manufactured plywood or oriented strand board (OSB). • Plywood: Constructed out of glued layers of orthogonally stacked wood veneers hot pressed together, plywood is a structural panel resistant to contraction and expansion. While lighter than OSB, when exposed to water, plywood is susceptible to delaminating and weakening, which can cause the sheathing to lose strength and compromise the nailing. In a worst-case scenario over a prolonged period of time, the roof covering will have to be removed, and the sheathing replaced. • Common OSB: In OSB, precisely cut wood strands are mixed with resin binders and oriented in a four-layer process in which two core layers are oriented perpendicular to two surface layers. The panel is then cured under intense heat and pressure to form a lasting bond between the strands. OSB sheathing is used extensively in residential and commercial construction as an alternative to plywood. Common OSB panels are typically heavier and less absorbent than plywood. 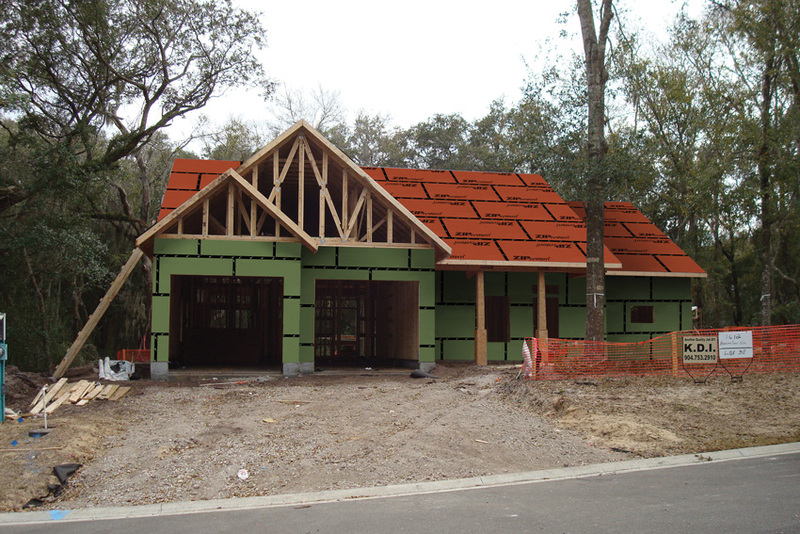 Roof sheathing systems with a water-resistive barrier integrated onto high-performance structural engineered wood panels with taped panel seams eliminate the need for felt, while increasing a home’s resiliency. • High-Performance OSB: Common OSB can be subject to edge swelling when exposed to moisture. However, high-performance OSB with greater water resistance is now readily available and commonplace. It is treated along the edges and surfaces to resist water, avoid edge swelling, and other rigors. High-performance OSB is considered a high-quality alternative to plywood and commodity OSB. It has been proven to be much more durable both during construction and severe weather events. Initially used for temporary protection against the elements, roofing underlayment is now an integral part of an overall roof system. It provides and extra layer of protection on top of the sheathing, in addition to the final roof covering, to help keep out water and moisture. Underlayment is also required by building codes in the interest of maintaining the integrity of the roof system with provisions for such things as resistance to fire, wind-driven rain, wind uplift, and punctures. The proper selection of a particular underlayment material depends on a variety of factors in addition to the code, including roof slope, the finished roofing material used, and climate. For example, an underlayment material that performs well under a metal roof in the hot, humid South may not hold up in a cold Northeast climate under wooden shingles. It is important then to understand the capabilities and appropriate applications for the different types of underlayment and their ability to perform well. Synthetic underlayments are available that offer greater resistance to water than felts but require careful installation over sheathing. • Synthetic: A relative newcomer to the marketplace, synthetic underlayments offer greater resistance to water than felts. Made of synthetic polymers, the exact composition of which varies among manufacturers, synthetic underlayments are lightweight, UV resistant, safer to walk on, and resistant to insects, fungus and rot. More expensive than roofing felt, synthetics are also more resistant to tears and wrinkles, and lay down more evenly. Synthetics also come in light colors, enabling the roof to stay cooler when exposed, and are fabricated in larger sheets, which can save time during installation. • Peel-and-Stick Materials: A roof underlayment with an adhesive backing that is peeled off and pressed into place, peel-and-stick materials are typically used in areas of the roof where ice dams or leaks are likely to occur. Considered a superior option for ice and water barriers, peel-and-stick underlayments can be a first layer of protection on potentially problematic areas or installed on the entire roof. Should water pool or collect on the roof, this underlayment prevents it from seeping through by forming a true water barrier. Thicker than other types of underlayment, peel-and-stick materials are noted for their durability to withstand the elements during roofing installation. One drawback is that the adhesive is temperature-sensitive until securely bonded to a dry surface and requires a primer when installed below 40–45 degrees Fahrenheit, depending on the manufacturer. Additionally, most of the materials are slippery and unsafe to walk on directly after application. • Combination Wood Structural Panel and Underlayment: A significant material breakthrough that is now readily available is the use of wood structural sheathing panels with a built-in moisture-resistive barrier. The integrated barrier makes the panel a combination of structural sheathing and underlayment that eliminates the need for an additional felt or synthetic underlayment application. This single-step installation makes roof construction quicker and easier even though it does require that seams between panels be sealed. However, as we have already seen, taping the seams is both a very positive and very inexpensive thing to do. 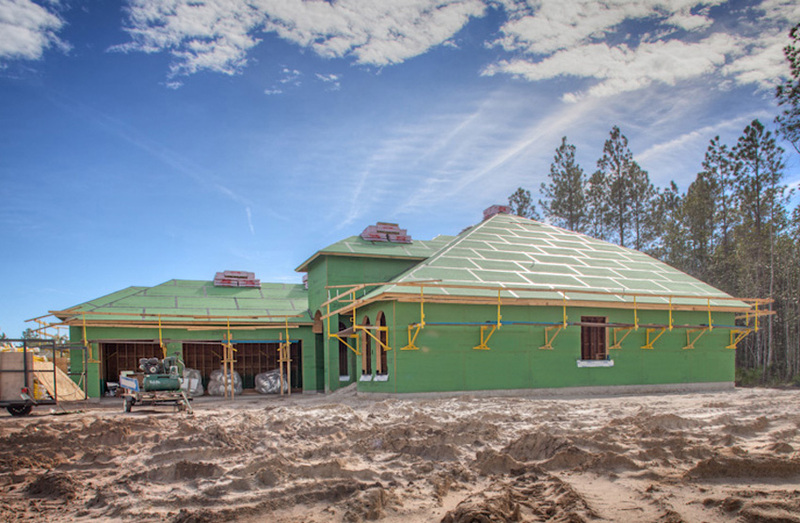 The taped panels create a structural roof system and code-recognized underlayment that can help the building qualify under the FORTIFIED program and, more significantly, hold up better during extreme weather events. Most of these combination panels have a clear fastening guide on the panel surface for fast, accurate installation. Builders report a 40 percent reduction in installation time, which can potentially reduce the size of the roofing crew required. “With these panels, it was a quicker, easier process that got us watertight and kept our job moving,” says Trey Little, project manager at Atkins and Associates Homebuilders in Nashville, Tennessee. Wood structural panels with a built-in moisture-resistant barrier provide sheathing and underlayment installed in one step and are rated for 180-day exposure to weather. Once the roof structure, sheathing, and underlayment systems are all in place, then the visible finished roofing materials can be installed. There are, of course, a number of choices, which vary by cost, suitability for different roof slopes, expected service life, wind resistance, and severe-weather durability, not to mention aesthetics. The finish roofing and the underlayment need to be compatible, too, so checking that detail can be important in the longevity of the finish roofing. • Asphalt Shingles: Affordable and reasonably durable, asphalt roofing shingles are the most commonly used option in North American wood-framed roofing applications. They tend to last longer in cool and dry conditions than in warmer and more humid climates, as extreme heat can soften and weaken the shingles, while high humidity can promote damaging mold growth. However, extra ice-guard underlayments may be required in northern climate zones since ice dams can melt and seep under the shingles, causing water damage to the regular underlayment and sheathing. In extreme cold, asphalt shingles can develop hairline stress cracks and break down before their anticipated service life of 20 to 30 years. 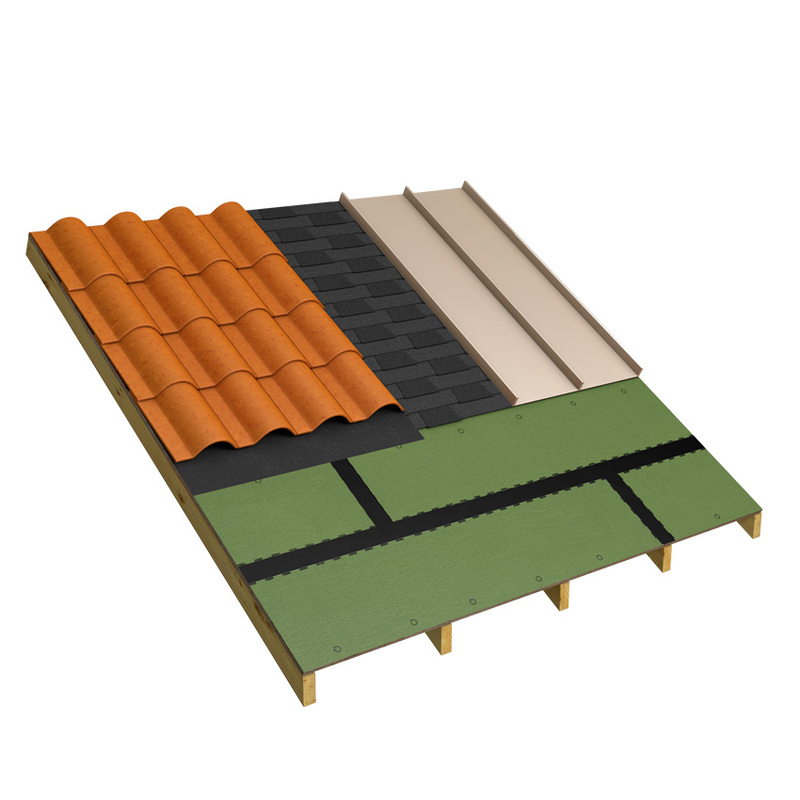 The international codes (IBC and IRC) address asphalt shingles specifically and impose additional requirements when they are used on low-slope roofs, such as the need for multiple layers of felt underlayment. On other slopes, they specifically require a single layer of felt underlayment or an acceptable alternative as reviewed earlier. In building locations prone to ice damming, the codes requires a peel-and-stick type of underlayment in critical areas, such as along roof edges and valleys. Asphalt roofing shingles are the most widely used option for wood-framed roofing systems in North America. • Clay, Slate, and Concrete Tiles: Tile roofs are the norm in Europe and many parts of the world and are used in higher-end homes in the United States. 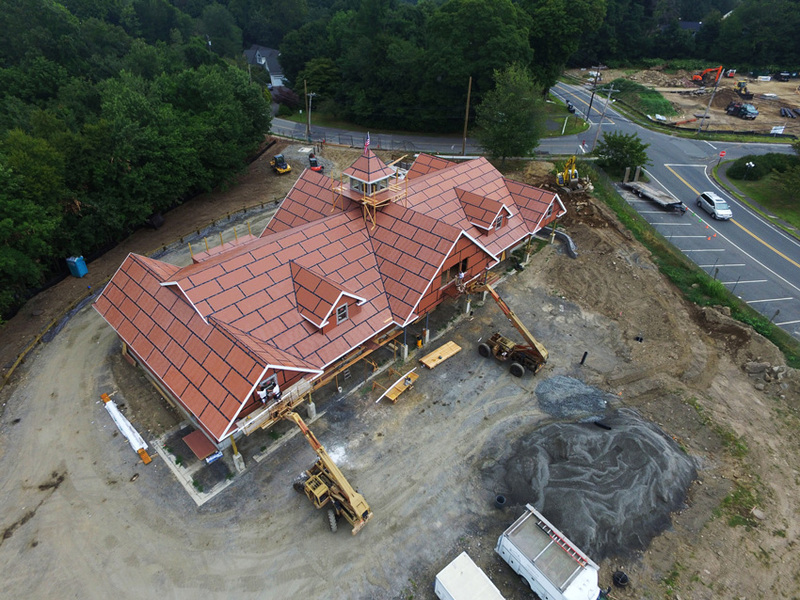 Clay tiles that interlock and create the iconic reddish, textured cap to a human-scaled building not only create a desirable aesthetic in some situations, but have the benefit of a proven, long-lasting roofing solution. Clay tile roofs have been in place for 100 years or longer with some maintenance required if any tiles become loose, broken, or otherwise damaged, but they are generally durable. Clay tiles have performed well in climates that receive a lot of sun, such as the Mediterranean areas of Europe or the southern United States. Slate is a natural material that, when installed properly, can require very little maintenance and hold up well in storms. Concrete tiles are considered a less-costly choice that bring some of the characteristics of clay and slate in resisting severe weather. Of course, all of these tiles will likely add more dead load weight to the roof system compared to other choices, so the wood framing and sheathing needs to be designed accordingly. Underlayment requirements per the codes for clay and concrete tiles are comparable to the requirements for asphalt shingles: two layers of underlayment on low-slope roofs, and one layer on steeper roofs. For slate shingles, underlayment should comply with ASTM D 226, which covers 15-pound and 30-pound felt, or ASTM D 4869 for felt applications in steep-slope roofs. Clay tiles or metal roofing are alternatives to asphalt shingles that can be used over properly selected sheathing and underlayment. • Metal: According to the Metal Roofing Alliance, a metal roof can be expected to last at least two to three times longer than other common roofing materials. While the initial cost may be significantly higher than an asphalt shingle roof, the longevity and low maintenance requirements of a metal roof may result in a much better life-cycle cost. Metal roofing can achieve a 140-mile-per-hour wind rating and is able to withstand extreme weather, such as high winds, heavy snow, hailstorms, and even wildfires. Ice and snow can easily slide off before building up and causing problems. However, care needs to be taken in design to prevent people from walking under metal roofs with accumulated ice and snow. In warm temperatures, metal expands so appropriate allowance for the expansion and contraction of the metal needs to be addressed. Metal surfaces are fire resistant, and the material is lightweight, making it easier to design the supporting structure and comply with fire code requirements. Light-colored metal may also lower energy bills for air-conditioning by reflecting the sun’s radiant heat away from the building. The IBC requires underlayment for metal roofing to comply with ASTM D 226, Type I or ASTM D 4869, and gives instructions for installing underlayment in ice-prone structures. • Felt: Traditional, black, asphalt-saturated roofing felt has been used in residential roof construction for decades and is in fact referenced as the standard in the International Building Code. “Felt paper,” as it is commonly called, is either coated or saturated with asphalt to make it water resistant, though not waterproof. Builder’s felt paper is available in 15-pound and 30-pound weights, which refers to the historical weight of the papers, though modern production has made them actually lighter. Although considered a relatively easy-to-use and cost-effective option, durability can be a problem. Felt paper can tear easily, especially when wet. The 30-pound paper is thicker and stiffer, less prone to tearing, and provides more protection from water, but it is also much heavier and can be more difficult to work with. Architects should be aware that there are several ASTM standards that offer specifications for asphalt-saturated felt that many manufacturers fail to meet according to the International Association of Certified Home Inspectors—the papers are saturated to a lower level, predisposing these underlayments to absorb water and fail sooner. High-performance wood-framed roof assemblies are clearly dependent on a number of factors. Each component of the assembly (framing, sheathing, underlayment, and finish roofing) must be addressed for both its individual capabilities as well as the ability to work with the other components to create cohesive system that can act together in all types of conditions. Those that meet the code minimums for construction can be expected to be durable and hold up under normal conditions. Building designs that seek to go beyond the code and hold up under severe conditions of wind, rain, storms, etc. need to look to other programs and standards for ways to achieve that higher degree of performance. In all cases, proper attention to detail and coordination with other design considerations can produce solutions that are not only cost effective during construction, but provide ongoing benefits to building owners over the life of the building. 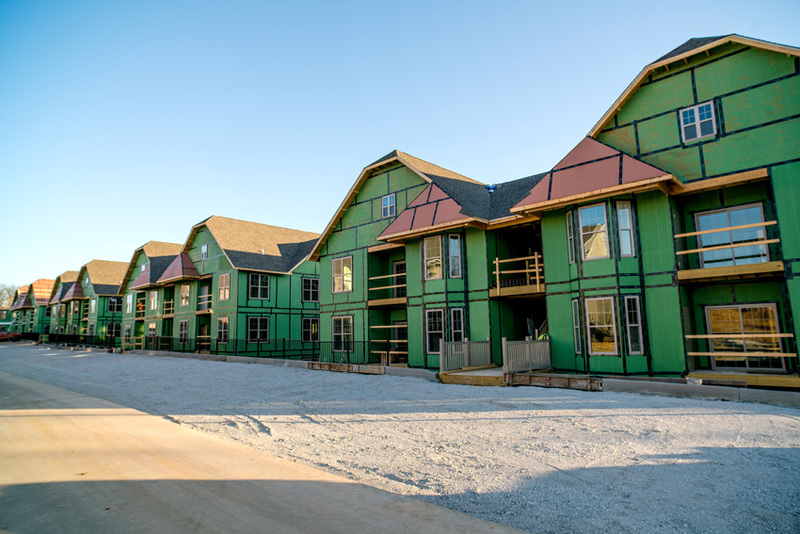 The International Building Code (IBC), which has been adopted by most states, gives the design and construction community specific criteria for different types of buildings that incorporate wood as part of the structural framing system. The IBC identifies five classifications of construction based on types of materials and required fire-resistance ratings. These five construction types are further divided into subclass A for high fire-resistance capability and subclass B for lesser fire-resistance capability. Construction Types I and II relate primarily to noncombustible materials, such as steel and concrete. Single or multi-story wood construction generally falls into construction Types III, IV, and V under the code based on the way that wood is used in the building. These three types are summarized below. • Type III (Ordinary): Type III buildings have noncombustible exterior walls (e.g. masonry) but have a wood-framed roof and floors. Dimensioned lumber is recognized as the basis for framing interior walls, floors, and roofs, including wood studs and joists, but can also include wood truss systems of differing types. To be categorized as a Type IIIA building, a one-hour fire resistance must be achieved throughout the building where applicable to separate spaces or floors, except that exterior bearing walls require no less than two-hour fire-resistive construction. Type IIIB has no fire-resistance requirements, except for the two-hour exterior bearing walls. • Type IV (Heavy Timber): Also known as Heavy Timber or HT, Type IV construction uses large, dimensioned timbers for structural members. This classification allows the exterior walls to be noncombustible materials and the interior building elements are of solid or laminated wood without concealed spaces. Fire retardant-treated wood framing is allowed in exterior wall assemblies with a two-hour rating or less. Interior wood columns, beams, floors, and roofs are required to satisfy certain minimum dimensions and no concealed spaces are permitted. • Type V (Light Frame): Type V construction includes the typical stick-built framing used in most residential and many light commercial buildings. This type is characterized by the structural elements, exterior walls, and interior walls made from any material permitted by code, including wood. The walls, floors, and roofs may be of any appropriately sized dimensioned lumber, and the exterior walls may be of combustible materials.